We're looking at bringing in a headrest made by a local builder, C&C Fine Cut. 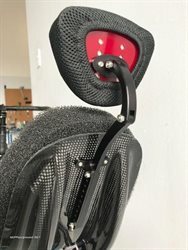 Sandor at Fine Cut is a roadie and recumbent rider and has made a beautifully functional headrest for carbon seats. We get a lot of questions about headrests and so when he contacted us and then showed us a sample, I was pretty excited. This headrest is not only nice to look at, but has a lot of vertical, fore/aft and rotational adjustment. Price is about $150 MSRP. Let me know if you think this is something you might be interested in. He's also looking at doing some other small items and specialty recumbent items as well. Looks pretty fine. Looking forward to reading a ride report on it.